Youth gardening programs have had a presence in many urban communities since the late 1880s. Early garden classroom pioneers saw the value of linking common gardening practices to the training of real-life skills, practical science applications and the creative arts to grow a well-rounded, capable young adult. 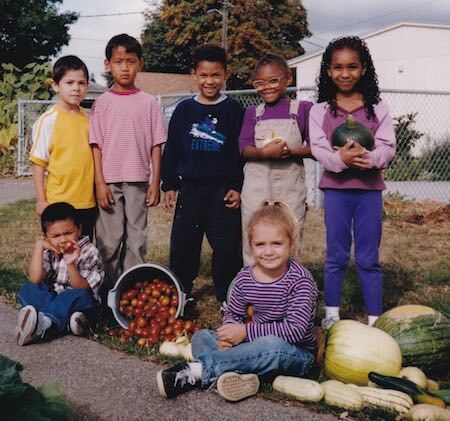 In Portland, some youth garden programs have disappeared across the years, due to lack of support or when the core group of children reach their teenage years/adulthood. A few programs have withstood the stress of time. Grow Portland, Growing Gardens, and Portland Parks and Recreation Community Gardens are the current elders of the local youth garden scene. With the help of the Oregon State University Master Gardener program – plus funding from a variety of creative sources and support from neighborhood schools’ PTAs – these programs have remained constant lighthouses on the grow-healthy and eat-green landscape. These programs serve thousands of children and their families annually. They serve up curricula steeped in worms, soil and garnished with seeds and poetry. The prize for a perfect radish is the glow of wonder and pride on a child’s face. A symphony of commingling cultures, languages, hand gestures and traditional wisdom is directed by competent professionals embellished with compassion, courage and the joy of transformation. A champion of Concordia’s local youth garden classroom scene is City Repair Project (CRP). It’s the dream of Portlander Mark Lakeman that evolved into existence in 1996. The CRP mission is to inspire and foster thriving communities through artistic reclaiming of public spaces around Portland and nationally. During the past 21 years, the project has partnered with several Portland youth garden classrooms. To learn more on how CRP intersects with the youth garden scene, attend Village Building Convergence. Ten days of mind-blowing and inspiring community building, hands-on workshops on permaculture, placemaking and urban design are scheduled in Portland June 1-10. Do you want to assure the continuation of youth gardening programs and/or participate in them? Here are resources to contact. « Ask the historian: What’s in this neighborhood’s name?